Immunizations are an important way to prevent the spread of infectious diseases, and to protect yourself if you’re ever exposed. The recent outbreak of Ebola in Africa has brought plenty of attention to this infectious disease, but it’s only one illness among thousands. Infectious diseases run the gamut, from the common cold to malaria or tuberculosis. What is infectious disease, and what causes it? By definition, it’s a microbial infestation of the body caused by a virus, bad bacteria, fungus or parasite. Although some of these conditions are life-threatening, many of our region’s most common infectious diseases are easily treated or, better yet, prevented. Many infectious diseases present symptoms such as breathing problems, a persistent cough that lasts longer than a week, severe headaches, seizures, fever, skin rashes or growths, loss of appetite, fatigue and muscle aches. Anyone who has been bitten by an animal – wild or domestic – is especially susceptible. Dr. Bob Tiballi is a board-certified infectious disease specialist at Germbusters, an independent practice specializing in the care of people with infections. He also practices at Advocate Sherman Hospital in Elgin, and other local hospitals. He says one of the more commonly seen infectious diseases around Chicagoland is Lyme disease, which is spread by tick bites. “The explosion of Lyme disease is due in part to deer migration, and in part to mild winters when ticks didn’t die,” he says. Also common is blastomycosis, caused by the fungus Blastomyces deratitidis. This fungus lives in moist soil with decomposing wood and leaves, according to the federal Centers for Disease Control and Prevention (CDC). Lung infection can occur after a person inhales airborne, microscopic fungal spores. Blastomycosis presents with symptoms similar to flu, and the infection can become serious if not treated. Patients may go months without being diagnosed correctly, because blastomycosis symptoms mimic those of less-serious diseases. In our region, some of the more rare but serious infections include bacterial meningitis and necrotizing fasciitis, the “flesh-eating” disease. Cancer patients, the elderly and others with weak immune systems are most vulnerable. “Following chemotherapy, immune systems are weakened, and patients are particularly vulnerable to infections,” Kochvar says. Infectious diseases are transmitted through viral, bacterial, fungal or parasitic pathways. Another common transmission is through the mosquito, which has been called “the most dangerous animal in the world” because it carries some of the world’s most deadly diseases, including malaria. According to the World Health Organization, mosquito-transmitted diseases are responsible for the deaths of more than 1 million people each year, most due to malaria. The CDC reported 1,925 cases of malaria in the U.S. in 2011, the highest number since 1971 – about twice as many as reported in 2008, according to a December 2013 report from Kansas State University Research and Extension. All but five of those cases were imported to the U.S. The West Nile virus, also transmitted by mosquito, has primarily affected only animals in Illinois this year, according to the CDC. About one in five people exposed to the virus has a reaction, developing a fever with other symptoms. The resulting fatigue and weakness can last for weeks or months. International travelers are more susceptible to other mosquito-borne illnesses, such as chikungunya. Common in the Caribbean, and occasionally appearing in Florida, chikungunya is more of a nuisance than a serious disease, says Tiballi, although symptoms such as joint pain can persist for years. International travelers should seek relevant immunizations before leaving the U.S., says Kochvar, who also recommends reviewing a travel itinerary with a travel immunization clinic. A wide variety of infectious diseases are spread through skin-to-skin contact. One common example is Methicillin-resistant Staphylococcus aureus (MRSA), caused by a strain of staph bacteria that’s become resistant to the antibiotics commonly used to treat ordinary staph infections. MRSA occurs in two different ways. First is health care-associated MRSA, affecting those who have been in hospitals or other health care settings, such as nursing homes and dialysis centers. Typically associated with invasive procedures or devices, such as surgeries, intravenous tubing or artificial joints, it causes life-threatening bloodstream infections. Health care providers abide by the old adage that “an ounce of prevention is worth a pound of cure.” After all, stopping diseases before they spread is far easier than fighting off an outbreak. Prevention today is especially pertinent because an entire family of bacteria has become resistant to antibiotics, something that’s “quite scary” to Tiballi and other health care professionals. Kochvar has seen a large rise in cases of drug resistance, and he’s concerned that it leaves fewer treatment options. “Transmission can occur not only from patient to patient, but the resistant genes can be exchanged from one type of bacteria to another,” he says. One way to help slow antibiotic resistance is to complete an entire course of antibiotics as instructed, rather than stopping the drugs once you feel better. When you stop early, the bad bacteria have a chance to evolve and become resistant to medicine, rather than being killed off completely. It’s also important not to overuse antibiotics, which are ineffective in treating viral illnesses. Immunizations are a significant first step toward the prevention of infectious diseases, says Grace McBride, RN, regional chief nursing officer for Presence Saint Joseph Hospital in Elgin. 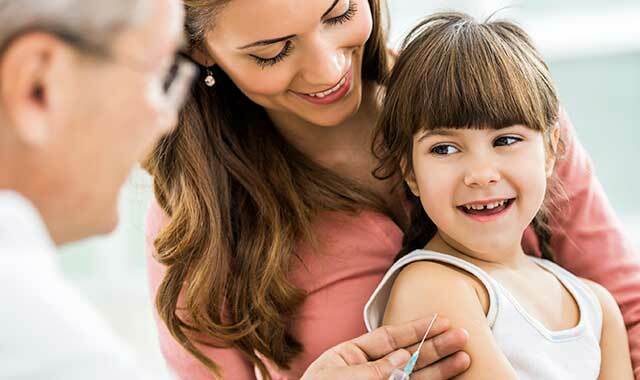 Routine immunizations include measles, mumps, rubella, tetanus, diphtheria, polio, flu, pneumonia, chicken pox, hepatitis A and B, and human papilloma virus (HPV). Tetanus immunizations should be updated every 10 years, she says, and adults may also become susceptible to pertussis, or whooping cough. If there’s a concern about potential sensitivities to immunizations, McBride says health care providers can screen patients and create alternative plans. Some of the simplest ways to prevent the spread of disease are good daily habits, starting with the practice of washing your hands. Some studies suggest we may be overusing antibacterial soaps, which may help germs to mutate. Any kind of soap will clean your hands. Wash vigorously, and wash often, McBride advises. Another important – and simple – preventative method is to cover coughs and sneezes, since they can project virus droplets through the air. Be sure to inform your primary physician of recurring symptoms and bouts with colds and flu, so that he or she can maintain your medical history accurately. And don’t wait until you’re desperately sick to go to the doctor. “It’s important to contact your physician early, especially if you have a chronic condition or are very young or elderly – two populations among the most vulnerable,” Kochvar says. Babies under 12 months who have a fever of 100 degrees or more should be seen by a physician; infections can overtake infants quickly. Given the ease with which disease spreads, it’s not surprising that hospitals regard cleanliness as a top priority. They have protocols in place to prevent transmission and contain the treatment of infectious diseases. For example, patients being treated for tuberculosis, which is transmitted by air, are placed in a negative airflow room that has specialized air filtration to prevent the spread of contaminated air. When health care providers deal with diseases like influenza, which is transmitted through larger droplets within several feet, anyone in contact with the patient is required to wear a mask. For diseases spread by contact, caregivers and visitors are required to wear gowns and gloves. Hospitals also maintain policies for proper cleaning procedures and monitoring of those procedures, says Kochvar. At Northwest Community Hospital, several “germ-zapping robots” are helping to eliminate hard-to-kill bugs in hard-to-clean places. The hospital’s Xenex robots use pulsed xenon ultraviolet light that’s 25,000 times more powerful than sunlight to destroy harmful bacteria, viruses, fungi and bacterial spores. The Xenex system can disinfect a room in minutes, and because it’s portable, it can be used virtually anywhere in the hospital. Because the robots use UV light, they can reach every surface in the room and leave behind no chemical residues. Each treatment takes about five minutes. After performing standard cleaning procedures, team members wheel the robot into a room, position it, open all drawers and closet doors, start it and leave. People can’t be inside the room when it is operating. A sign is placed outside the door warning against entry, but if motion is detected, the machine automatically shuts off. The process is repeated on the other side of the bed and in the bathroom, for a total of 15 minutes, to thoroughly clean the room. This entry was posted on Tuesday, September 30th, 2014 at 12:00 pm	and is filed under Health & Fitness, Top Posts. You can follow any responses to this entry through the RSS 2.0 feed. Both comments and pings are currently closed.